A special thank you to Penguin Random House First to Read for an ARC in exchange for an honest review. Michelle Kuo is a recent Harvard graduate that finds herself in a rural town in Arkansas as a Teach for America volunteer. Wanting to make a difference in her students' lives, she is full of optimism but soon discovers how broken the system is. Kuo tries a different tactic—she uses quiet reading time and guided writing exercises as a way to instil a sense of self in her students. Throughout her tenure, Kuo loses students for various reasons. Some are as simple as truancy and others are harsh and stem from violence. She also is inspired by some, and one of those students is Patrick who is fifteen and is still in grade eight. Under Miss Kuo's attention, he flourishes. However, Michelle is feeling incredible pressure from her Taiwanese immigrant parents to pursue other opportunities and ultimately leaves Arkansas after a couple of years to attend law school. On the eve of her graduation, Michelle learns that Patrick has been incarcerated for murder. Murder? Patrick? Kuo has incredible guilt and thinks that she is partly responsible because she prematurely left the school. Determined to right the situation as best she can, Michelle returns to teaching Patrick from his jail cell while he awaits trial. It is here that we get a sense of both of their characters. Michelle doesn't waiver in her dedication, even when it appears as though Patrick has forgotten most of what she taught him. 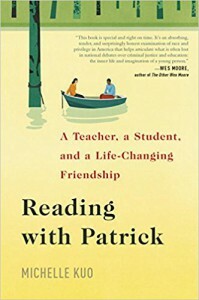 In this moving and inspiring memoir of a teacher that didn't give up on her student, Patrick, Kuo shares the story of her mentorship of Patrick Browning and his incredible journey of self-discovery through literature and writing. Kuo is also taken on her own journey as she is forced to navigate through several broken systems, racism, social standing, privilege, and relationships. Friendship can come unexpectedly sometimes, and you never know your impact on someone else's life. I highly recommend this wonderful story.